Sustainable White Roofing – Avoid a Roof Tear Off Indefinitely! Roof coating systems such as National Coatings’ AcryShield Roof Management (ARM) and AcryPly Roof Restoration Systems offer a sustainable solution that can remain in place indefinitely, when properly maintained and serviced. 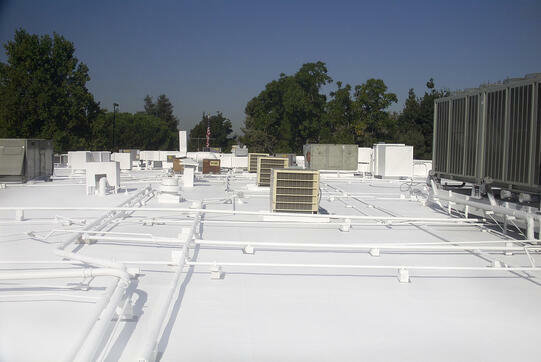 These white roofing systems provide superior durability, strength and performance over aged and failing asphalt (BUR and Mod Bit), single-ply (EPDM, Hypalon, PVC and TPO), metal, spray polyurethane foam (SPF) and concrete roofing. These white roofing systems offer excellent cost savings, long-term value, and environmentally friendly benefits. Sustainable roof-coating systems are applied directly on top of the existing roof membrane, avoiding any roof tear-off from the start. When renewed and maintained properly (check out our semi-annual roof maintenance check list, for conducting a thorough roof inspection) these roofing systems can be re-coated every 10-plus years to lengthen the roof-life, renew the reflectivity, and insure excellent waterproofing capabilities. This renewed membrane is essentially a new impermeable roof that provides excellent energy efficiency and savings as the reflectivity has been restored, all while avoiding a costly and timely tear off. Roof tear offs entail extensive labor, upgrades to current building codes and current energy compliance since the majority of the roofs that are good candidates for coating are secondary roof systems that were installed over the original roof to avoid the costly tear off at the time of its installation. Even more disruption can occur due to the possibility of interruption to ongoing business activities beneath the assembly or worse the closure of operations entirely. Construction permits are necessary with tear offs where in most cases coating of existing roof assemblies are not since it is considered maintenance under most jurisdictions. Last but not least the additional landfill fees and contribution of waste to already overly congested landfills are imminent. Some roofing professionals desire to install a traditional roofing system (one that requires a roof tear-off) to gain from the financial benefit of the extensive labor and time. They might suggest restoring your current roof for the time being until you can afford to install a more traditional roofing system (in most cases the one that is failing you, which needs to be replaced or fixed). National Coatings suggests differently! We suggest you restore your roof now and continually renew or restore your roof as our applications are sustainable with proven results of savings both in the short and long term of the facility’s needs. Needless to say, the process is much more tolerable financially and does not have the aforementioned issues of interruption to your business. Restoring your existing roof with our AcryPly Roof Restoration System will provide you with several benefits. 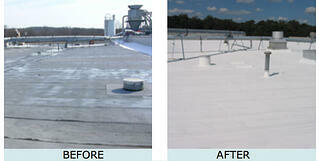 You will gain superior UV protection, a lengthened roof life and lowered roof maintenance costs. You will achieve excellent reflectivity for cooler indoor ambient air temperature and energy cost savings immediately and you will receive a durable, seamless, watertight roofing membrane all while your business is open, operating as usual with no interruption to your revenue stream. . Then 10-15 years down the road, when your roof needs to be renewed, you can repeat the installation of the ARM System and gain all of the above benefits again and again without ever needing to replace your roof. Want more on sustainable white roofing? We have conducted a life cycle cost analysis to demonstrate the financial benefits of renewing your roof for the second time – click here to read. Or download our FREE Guide to Roof Coatings.